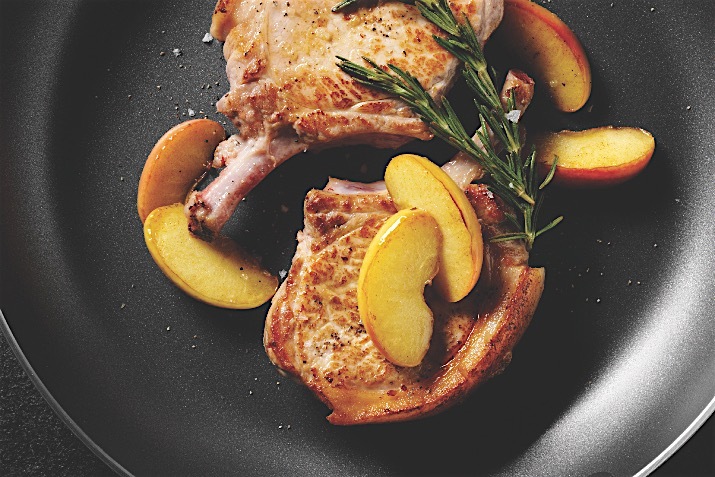 These succulent, flavorful pork chops are made even more so with the addition of gingered apples. Mix the brine ingredients in a large container, and submerge the pork chops in brine. Cover and refrigerate for 4 to 6 hours. Prepare spice rub while the pork is brining (reserving 1 teaspoon to season the apples). Remove the chops from the brine and blot dry with paper towels. Rub with spice rub and set aside. Heat 1 tablespoon butter in a large skillet over medium heat. Sauté the onions until softened, then add apples, ginger, wine, water, 1 teaspoon of spice rub, and a pinch of salt. Cook for about 15 minutes until apples are soft. Turn off the heat and reserve. While the apples cook, heat 1 tablespoon vegetable oil in an extra large skillet over medium-high heat. Place the pork chops in the pan and cook for about 4-5 minutes per side until well browned. Reduce heat to medium-low, cover skillet and cook for a few more minutes. Use a thermometer to test the pork chops and remove them from the pan when they reach 155 degrees F.
Add the applesauce to the skillet and heat through, scraping up the bits off the bottom of the pan. Place each chop on a serving plate, and divide the sauce evenly among the chops. Accompany the pork chops with garlic mashed potatoes garnished with some fresh chopped rosemary or chives, and a mug of warm mulled cider.